Kickstarter success for Hooke wireless 3D audio headphones | What Hi-Fi? The latest product to strike a chord with the Kickstarter crowdfunding fraternity has been revealed – and it has come from in the shape of Hooke's "multi-functional wireless 3D audio" headphones. With the design work now complete, Hooke is now poised to enter mass production after its target of $100,000 was hit with ease. The product eventually attracted Kickstarter pledges worth over $160,000. Bluetooth-enabled, Hooke is described as a "simple, affordable and wireless" pair of headphones that lets you listen to your favourite tunes, but also integrates with social networks via your smartphone. Hooke's multifunctional claims are based on the headphones' ability to access streaming and download services including Spotify; record music from a variety of devices; and its video and gaming capabilities. The 3D audio element makes use of binaural recording, where two microphones are used for the creation of 3D stereo sound, positioning those microphones by your ear, rather than in a mic in your hand. A 3.5mm cable is also available for wired connections, while Hooke claims to be the first wireless headset that lets you send and receive stereo audio thanks to its custom-made Bluetooth chip. The Hooke smartphone app lets you live-stream 3D audio and, once paired with your device, you can share the audio you record via Facebook, Snapchat and even your smartphone's built-in camera. It's anticipated that the first Hooke headphones will start shipping in June 2015, following a three-stage development process. 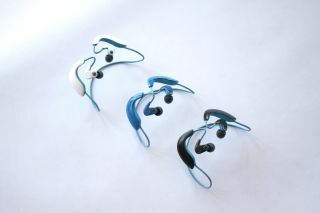 The headphones come in three colours: black, blue and white. For more details, take a look at the Hooke Kickstarter page.